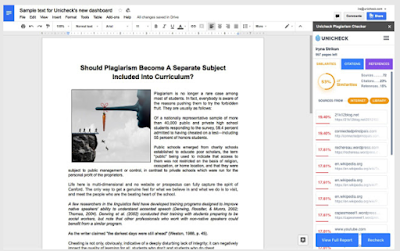 Unicheck, well-known in the educational circles for their technological breakthroughs and innovations, has created a Google Docs plagiarism checker add-on that enables users to check their texts directly in their writing environment, without leaving Google Docs. The decision to develop plagiarism checker that is fully integrated in Google Docs was inspired by Unicheck’s recent unique integration with Google Classroom, the only plagiarism detection software that allows educators to automatically check student submissions in Google Classroom. 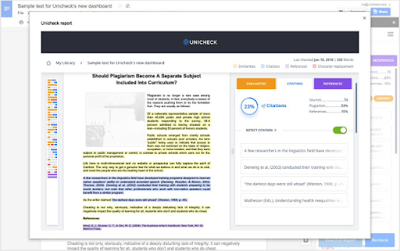 Students, teachers, and content creators can use Unicheck add-on to perform checks directly where they are creating or reviewing the document. Akin the functionality of the stand-alone version of Unicheck or that of the different integrations of the checker with most LMS, the add-on version of Unicheck proves to be of the same high standard. Users can check for similarities, citations, and references, and can review match sources, exclude and include citations, and more. The checker is able to recognize citations and references formatted in most of the academic styles, and accesses billions of web pages in real time. This ensures accuracy of the results that hundreds of educational institutions trust worldwide. Reports on all checked Google Documents will be added to the user’s personal dashboard by default, making sure they can be accessed from anywhere, anytime. Getting started. Open a file in GDocs and install the add-on. Launch it and a pop-up window will show up at the right side of a usual Google Docs interface. To use the add-on, sign in to your Unicheck account or create a new one. The process of scanning a text for similarities is same as for regular standalone Unicheck account. By clicking “Start check” initiate the scanning, and in couple of seconds get a check report. See percentage of similarities, citations and references in a paper without redirecting to Unicheck account. The check report is fully interactive and clickable. Choose a link from similarity sources and exclude it from the list. Do the same thing to manage citations. To get more details on the check, open full check report. Find parts of the text highlighted with different colors. Click them to see particular sources where similarities were found, or check on citations and references. Unicheck is known as a similarity detector and state-of-the-art technology developed specifically for higher education and K-12. Aligned with recent educational trends, Unicheck strives to spread educational technologies and standards of academic integrity. Advanced search technology and constant updates have made Unicheck one of the leaders among plagiarism checking software.